There are plenty of other veggies or fruit you can add to this recipe, even herbs or spices. But this is my favourite go-to recipe and it only takes 5 minutes to wack up. It’s ridiculously SIMPLE! I tend to have this as an afternoon snack in between teaching yoga as it’s light enough to exercise on. It’s also easy to eat on the go, however the cheese will start to go tangy if left out of the fridge for more than a few hours. The most important thing in my opinion when eating cottage cheese, is to add to crunchy texture to it. 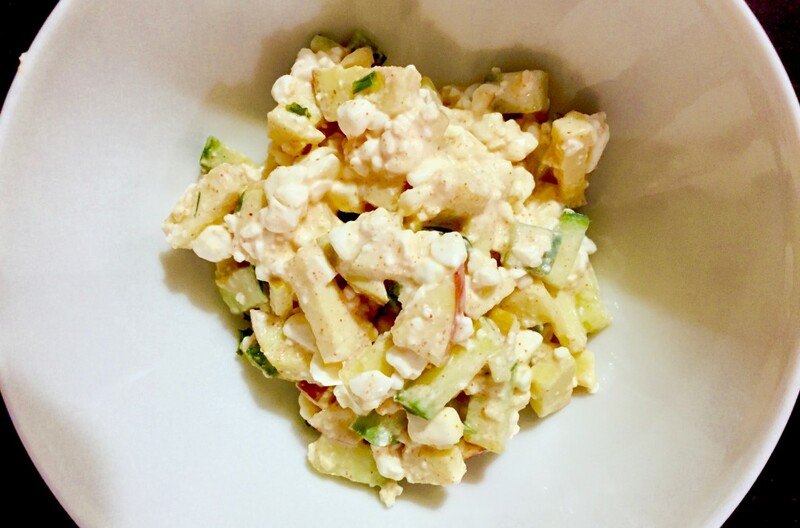 I also love contrasting cottage cheese with the sweetness of apple to make it a bit more interesting.. Make a big batch, store in a tupperware in the fridge and eat throughout the week. As always try to use organic/bio ingredients for the sake of your health and that of the planet. Wash the outside of the apple and cucumber and then dry with a clean tea towel. Core the apple and chop into small pieces. Put into a large bowl. Chop/dice half a cucumber and mix into the bowl with the apple, lemon juice and 1/4tsp salt. Scrape the mixture to the side of the bowl leaving a space to pour in the cottage cheese. Sprinkle the paprika over the cheese and mix it in before folding the whole lot in together. Be careful not to stir or mix too hard or it can release the water in the cucumber and apple and make the salad liquidy. Serve or chill in the fridge or feel free to add cherry tomatoes or anything else that you think may go well. Enjoy!